The Vought Corsair of World War II is undoubtedly one of the most recognized shapes to grace an aircraft. Its fame was increased by the use of later models in Korea and by popular television shows. Even today is is not unusual to see the 'bent wing bird' at local airshows. Enough Corsairs survived to make them very popular warbirds and there are a number of them still in the air 60 years after the prototype first flew in 1940. 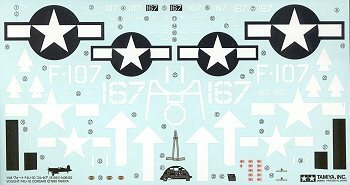 Tamiya's kit of the F4U was very well received when first released in the mid-1990s. There have been three different boxings of this kit. 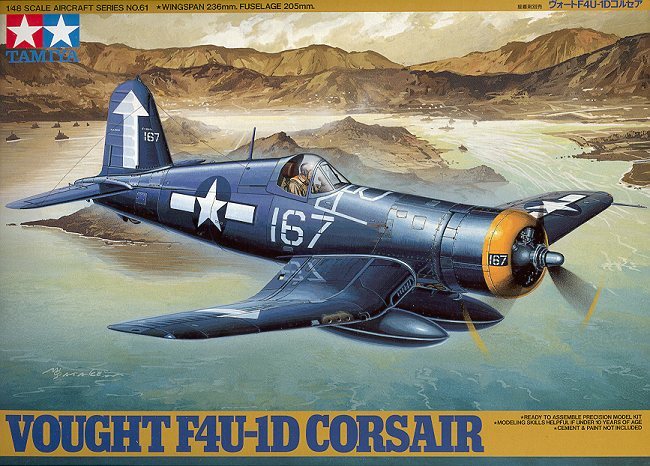 The first as a 'birdcage' F-4U-1, then this issue and recently another as an F4U-1A. Common to all of them are the usual superb engineering and design. All of them also have separate flaps and the ability to build the kit with the wings folded should you desire it. Added to this particular kit are rocket rails and twin drop tanks. A nice touch is the inclusion of blanking plates for the fuel tank pylons should you decide not to use them. You also get the option of having open or closed cowl flaps. There are also two separate canopies; one with braces and the other without. A figure of a pilot getting ready to board his aircraft is part of the kit. Also are wing braces when doing your kit with folded wings. 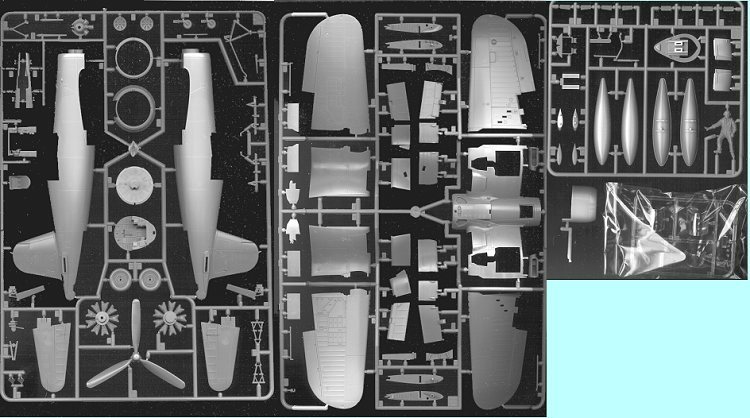 The wings in the folded position fit into hefty spars so there is no problem of this being a weak part of the kit. There are decals for three aircraft, all of them in overall sea blue. First is one from VF-84 on the Bunker Hill in Feb 1945. This aircraft has a yellow cowling and large arrow on fin and right wing. Next is a VMF-112 bird from the Bennington in about the same time frame. This one is is a bit less colorful and has smaller arrows on the tail and right wing. Finally, one from VMF-913, a training squadron at Cherry Point in early 1945. Also on the sheet are an instrument panel, seat harness and the tape that was often put over the nose fuel tank to prevent leaking. The decals look very nice, though a bit thick. Unlike Hasegawa sheets, the white on this sheet is white and not ivory. Tamiya decals have always been pretty good and having the underlying dark blue show through the white should not be a problem. Another excellent kit from Tamiya and one that should build very nicely.